The desires that tug on your heart-realized dreams, grand adventures, new experiences-require purpose and planning, time and effort. Is it possible to pursue God's call while still finding contentment right where He has you now? If you find yourself aching for more in a cycle of never-ending demands and never enough peace, Karen invites you to seek the joy in each season, take firm hold of God's calling, and savor a deeply fulfilling life. 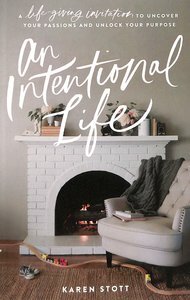 About "An Intentional Life: An Invitation to Discover Your Calling and Find Lasting Contentment"
Karen Stott nbsp;is a visionary, entrepreneur, and farm girl. Founder of Pursuit Community and Haven Hill Ministries, she believes the good stuff is worth fighting for. Karen and her husband, Isaac, live on a small farm in the Pacific Northwest with their 3 children, 2 puppies, and 14 chickens. Follow her on Instagram @KarenStott and www.anintentionalhome.com.